Mailtraq spam control provides the very best power features to counter spam, that can be used individually or in combination and are included with your Mailtraq Professional License. You have premium anti-spam controls at no extra charge. Without robust spam controls unwanted emails clog inboxes and waste time and resources, but over aggressive spam controls risk losing legitimate messages. Mailtraq's spam controls provide an excellent balance allowing the free flow of 'good' messages while carefully blocking spam. See spam and virus control video. Greylisting - Probably the single most effective tool to defend you against spam. 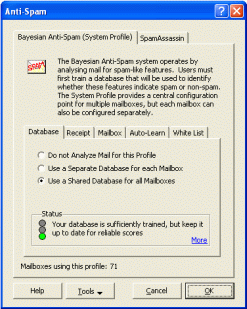 SpamAssassin - is an open-source mail filter project with a diverse range of tests and is very effective in separating spam from non-spam mail. Connection Management - Easy to use controls to reduce spammers connections by up to 90%. Viruses can be one of the most crippling threats to an organization, destroying information and taking computer systems out of action whilst they are rebuilt. As most viruses these days arrive by email, Mailtraq virus control can play an important role in protecting the organization. Mailtraq enables you to use a number of different technologies to achieve virus control - you are not locked in to one particular approach or anti-virus vendor. The virus control interface is integrated to the Mailtraq Console under the Options menu. Mailtraq also integrates with the free ClamAV anti-virus control system as well as the leading antivirus software for mail servers.